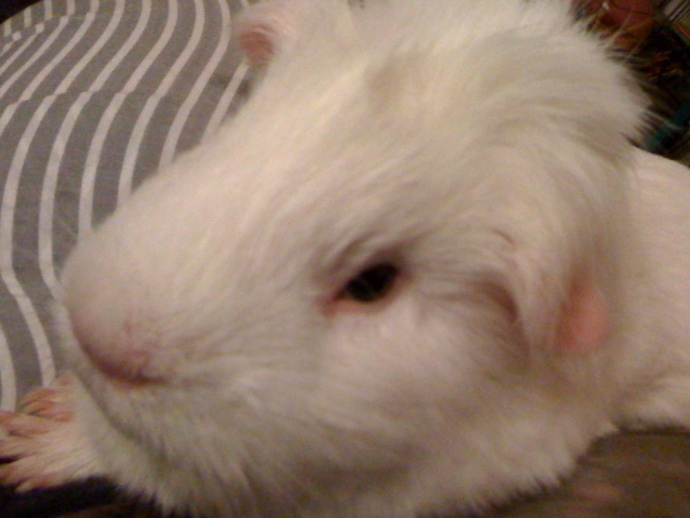 Much of the time guinea pigs are still little creatures. They’ll sit on your lap and barely move. It lulls you into thinking they are slow. Cavies are cute, cavies are furry, they’re squeaky and cuddly but they’re not slow. When it’s time to put Princess Piggy Poo back into her cage after playtime, I have to be careful. First, she can scratch the hell out of me; second she’s fearless as soon as she sees her hiding house. Most of the time, I grab around her body and her little legs run a mile a minute in mid air away from my flesh. It looks like Fred Flintstone driving his car—pretty comical and worth dangling her for a few extra seconds to watch. If only it was always that fun and easy. As careful as I try to be, more than once Princess Piggy Poo has leapt from my hands and flown into her cage—usually crash landing on her hay. It’s startling when it happens. I’m always afraid she’ll fall down and break her crown. And, like 30 million other Americans, Princess Piggy Poo doesn’t have health care—so all the king’s horses and all the king’s men won’t be able to put Princess Piggy Poo together again. How do I explain to a guinea pig that she isn’t supposed to fly? Let’s hope Princess Piggy Poo leaves flying to birds, bugs, planes and other things equipped with wings.